WJSG Internet Radio: 'American Idol' Recap: The Beginning Of The 'Zoanette Era'? 'American Idol' Recap: The Beginning Of The 'Zoanette Era'? "American Idol" is pushing hard for a female winner this year. Not since Jordin Sparks was crowned winner way back in 2007 has a woman worn the "Idol" crown, and it seems like producers are getting antsy. Thursday's episode, which centered on the women of Hollywood week, opened by asking the question, "can Season 12's ladies reclaim the title?" and later called this year's females "the most talented bunch of ladies we've ever seen." Let the conspiracy theories start flying, but it seems like "Idol" will do everything in its power to not let another guy win this year. Thursday's episode began with 47 females and eventually narrowed the field to 20. 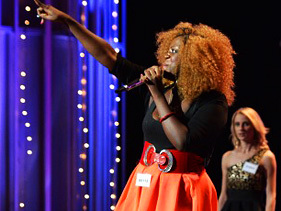 Previous standouts Candice Glover and Janelle Arthur continued to shine, and Angela Miller stepped up to become one of the contestants to watch this season. Miller, an 18-year-old from Beverly, Massachusetts, performed a stunning original song called "Set Me Free" that she had written two months ago, and brought all four judges to their feet after she performed it while sitting at the piano. "Good lord!" Keith Urban exclaimed after the song. "If that was recorded right there, I would play that in my car." Meanwhile, Tulsa wildcard Zoanette Johnson continued to flabbergast the judges, this time with an original song that was called, by Ryan Seacrest in voiceover, "the most shocking performance of the season." Johnson sat at her drum kit and banged out a simple drum pattern, while egging on the band to keep up with her and making up nonsense lyrics about the judges. If it wasn't quite shocking, it definitely made an impression, and the judges took note. "It was a classic," Mariah Carey declared. "Seriously, I think people are going to be looking at this performance for years to come." Nicki Minaj concurred: "I am bowing down at your feet today," she told her. "I am honored to be a part of 'Idol' this year just to say that I was a part of the Zoanette era." After several cuts, the talent pool was winnowed down to 21 girls, and two -- Stephanie Schimel of Milwaukee, Wisconsin, and Rachel Hale of Prescott, Arkansas — were forced into a sing-off. Both chose songs by former "Idol" contestants, but Hale's version of Haley Reinhart's "Undone" went over better than Schimel's take on Phillip Phillips' "Home," and Schimel was sent packing. The episode closed with Hollywood Week's 28 males being cut to 20, and it came down to a sing-off between Adam Sanders and Josh Holiday. Holiday split his pants while singing "Georgia on My Mind," which somehow wasn't held against him, and he was given the spot over Sanders. The field is now down to 20 guys and 20 girls, and they're all off to Las Vegas, where the girls will compete starting Wednesday. Then we'll see if this is shaping up to be a girl's year on "Idol" after all.